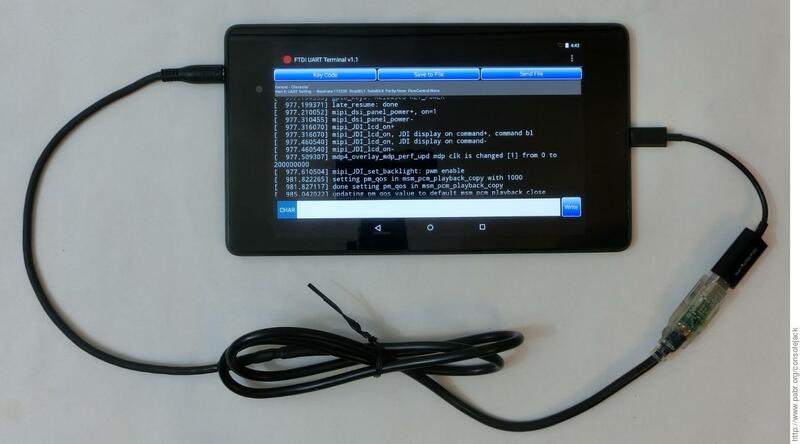 Many Google Nexus smartphones and tablets have a serial console which can be accessed through the headset socket. This is an invaluable tool for software development. Unfortunately there are no suitable off-the-shelf adapters on the market; therefore some tinkering is required. In the process of porting Linux kernels to poorly documented embedded devices, one of the first milestones is seeing log messages on a serial console. Sometimes the serial port is exposed as such. Sometimes it is hidden in a USB OTG port and enabled by a magic resistor value on the ID pin. Sometimes the serial port is merely a bunch of unlabeled pads on the circuit board. Many mobile devices have an audio socket, even very small ones. USB ports may become extinct if inductive charging becomes popular. Note that alternate functionality on 3.5 mm audio sockets is not a new idea. Mobile phones used to output analog video that way before the advent of MHL and SlimPort. WARNING. I do not recommend following the instructions in these posts. The proposed designs use 3.3 V USB-UART adapters and resistive voltage dividers, resulting in poor signal integrity, unnecessary power dissipation and mismatched logic levels. The point of the present article is to do better. Failing to obtain console output from a freshly compiled kernel on undocumented hardware is frustrating enough; I would rather not have to worry about faulty cables or fried UARTs when this happens. Injecting a certain voltage into the MIC pin causes the socket to switch from audio mode to serial mode. RX/TX logic levels are probably 1.8 V instead of the usual 3.3 V.
On some devices the serial console must be enabled by appending parameters on the kernel command-line. On the Nexus 7 2013 it looks like the serial console is already enabled by console=ttyHSL0,115200,n8, but for some reason the bootloader skips that part of the command-line. Audio: headset: add debug board detection mechanism. (Nexus 7 2013 "flo"). The official Google requirements for audio sockets on all Android devices ([WAHS]) confirm that the pinout order is (usually) CTIA/AHJ: (tip) LEFT - RIGHT - GROUND - MIC (sleeve). Notably, the MIC bias voltage can be anywhere between 1.8 V and 2.9 V. Therefore it is reasonable to expect that any threshold intended to trigger the serial functionality should be higher than 2.9 V, although Google may have enforced a MIC bias voltage in the bottom of that range on their Nexus devices. In May 2015 Google published the schematic for (presumably) the adapter they use internally ([DEBUGCABLE], announced here), albeit with some disclaimers ("No Warranty expressed or implied"). Actually, they released the whole manufacturing information, which you could send to a fab shop instead of reading further. The adapter contains a 1.8 V voltage regulator which powers the VCCIO input of a FT232R USB-UART chip. The adapter contains another voltage regulator apparently intended to supply 3.36 V. Based on component values, tolerances and datasheets ([TPS717]) the actual output range is 3.30 - 3.49 V.
This voltage is injected into the MIC input through a 33 Ohm PTC thermistor (Ihold=36mA and Itrip=71mA according to datasheets; Ihold=29mA and Itrip=61mA according to the BOM). Why did they not use the 3.3 V regulator that is built into the FT232R ? Maybe it cannot supply enough current to overcome the MIC bias on some devices, or maybe they decided that it is not accurate enough (the guaranteed output range is 3.0 - 3.6 V according to [FT232R]). At the time of writing there are apparently no off-the-shelf USB-UART adapters with 1.8 V logic levels and an additional 3.3 V output. Until someone decides to bring the Google design to market, I am testing the following homebrew solutions. The FTDI TTL-232RG-VREG1V8-WEFTDI TTL-232RG-VREG1V8-WEFTDI TTL-232RG-VREG1V8-WEFTDI TTL-232RG-VREG1V8-WE is a USB-UART adapter cable with 1.8 V logic levels. Unfortunately the VCC output (red wire) is also at 1.8 V, and the 3.3 V line is buried in plastic moulding ([TTL-232RG-VREG1V8-WE]). The catalogue showed an all-black product but the unit I received came with a transparent plug, so I was able to cut and melt my way to the relevant pads on the PCB. I disconnected the red wire and rerouted it through a 33 ohm resistor to 3V3OUT at C7 (also reachable at JP4). I checked that 3V3OUT actually outputs 3.30 V. As already mentioned, the datasheet only guarantees a range of 3.0 V (possibly too low to trigger serial mode) to 3.6 V (possibly dangerous). Then I re-sealed the moulding with epoxy. It is worth remembering that the good old 3.5 mm audio jack is not a very safe connector. If the sleeve gets shorted to ground, the FT232R will not be able to hold 3V3OUT at 3.3 V (maximum current is 50 mA according to [FT232R]). Since the FT232R uses 3V3OUT internally to power its USB interface, this might cause problems. For the same reason, any high voltage accidentally applied to the sleeve might feed into the host computer through the USB port. I would have used a PTC fuse, as Google did, if I had had one in my parts bin. This variant should be easier to build, but less compact. FT232R-based USB-UART adapter boardFT232R-based USB-UART adapter boardFT232R-based USB-UART adapter boardFT232R-based USB-UART adapter board whose VCCIO pin can be jumpered to VBUS (5 V) or 3V3OUT (3.3 V), or connected to an external supply between 1.8 V and 5 V.
TRRS jack and cable, e.g. from an old headset. [WAHS] Wired Audio Headset Specification (v1.1). http://source.android.com/accessories/headset/specification.html. [DEBUGCABLE] USB debug cable design documents. https://android.googlesource.com/device/google/debugcable. [FT232R] FT232R USB UART IC Datasheet. http://www.ftdichip.com/Support/Documents/DataSheets/ICs/DS_FT232R.pdf. [TPS717] TPS717xx Low-Noise, High-Bandwidth PSRR, Low-Dropout, 150-mA Linear Regulator. http://www.ti.com/lit/gpn/TPS717. [TTL-232RG-VREG1V8-WE] TTL-232RG TTL to USB Serial Converter Generic Cables. http://www.ftdichip.com/Documents/DataSheets/Cables/DS_TTL-232RG_CABLES.pdf.